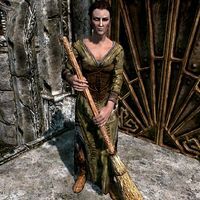 Sosia Tremilia is an Imperial miner living with her husband Skaggi Scar-Face, the owner of Left Hand Mine south of Markarth. When you arrive at the mine for the first time, you will find all inhabitants gathered outside, circled around the two survivors from Kolskeggr Mine. Sosia Tremellia will be there too, but will not participate in the heated conversation about the Forsworn attack. After the meeting, she will return to her regular duties. She sleeps in her husband's house every night between midnight and 6am and starts the day with a one-hour breakfast. At 7am she ventures outside, and uses a pickaxe on the rock next to the front door, or wanders around carrying her basket with herbs. At noon and 6pm she enters the house for quick one-hour meals. After her dinner, she stays inside until it's time to go to bed. She wears a set of farm clothes along with a pair of boots and wields an iron dagger. She carries her house key and a selection of common items and gold. Before you resolve the problems at Kolskeggr Mine, Sosia will be quite frightened and say, "Kolskeggr, overrun with Forsworn, what next? ", "Did you hear that? Pavo was driven out of his mine. Almost everyone is dead." and "What if the Forsworn come here? We aren't safe." At all other times she will just point you towards her husband with "You should speak with my husband. Skaggi runs everything."